Kubernetes is an open-source orchestration platform for working with containers. At its core, it gives us the means to do deployments, easy ways to scale, and monitoring. 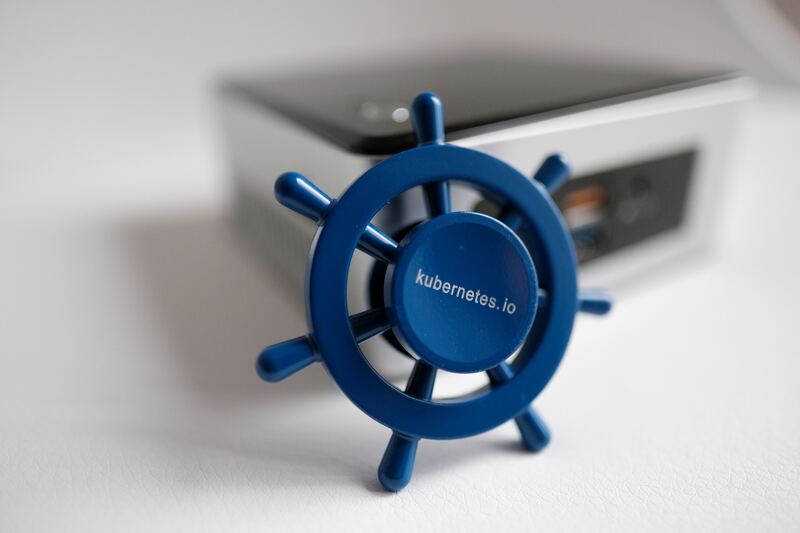 In this article, we will talk about the built-in monitoring capabilities of Kubernetes and include some demos for better understanding. At the infrastructure level, a Kubernetes cluster is a set of physical or virtual machines, each acting in a specific role. The machines acting in the role of master function as the brain of the operations and are charged with orchestrating the management of all containers that run on all of the nodes. kube-proxy: is in charge with maintaining network rules for the node. It also handles communication between pods, nodes, and the outside world. container runtime: runs containers on the node. Pods: are the basic unit of deployment within Kubernetes. A pod consists of one or more containers that share the same network namespace and IP address. Services: act like a load balancer. They provide an IP address in front of a pool (set of pods) and also a policy that controls access to them. ReplicaSets: are controlled by deployments and ensure that the desired number of pods for that deployment are running. Namespaces: define a logical segregation for different kind of resources like pods and/or services. Metadata: marks containers based on their deployment characteristics. Monitoring an application is absolutely required if we want to anticipate problems and have visibility of potential bottlenecks in a dev or production deployment. Kubernetes dashboard: gives an overview of the resources running on your cluster. It also gives a very basic means of deploying and interacting with those resources. cAdvisor: is an open source agent that monitors resource usage and analyzes the performance of containers. Liveness and Readiness Probes: actively monitor the health of a container. Horizontal Pod Autoscaler: increases the number of pods if needed based on information gathered by analyzing different metrics. In this article, we will be covering the first two built-in tools. A follow up article focusing on the remaining tools can be found here. There are many Kubernetes metrics to monitor. As we’ve described the architecture in two separate ways (infrastructure and logical), we can do the same with monitoring and separate this into two main components: monitoring the cluster itself and monitoring the workloads running on it. All clusters should monitor the underlying server components since problems at the server level will show up in the workloads. Some metrics to look for while monitoring node resources are CPU, disk, and network bandwidth. Having an overview of these metrics will let you know if it’s time to scale the cluster up or down (this is especially useful when using cloud providers where running cost is important). Metrics related to deployments and their pods should be taken into consideration here. Checking the number of pods a deployment has at a moment compared to its desired state can be relevant. Also, we can look for health checks, container metrics, and finally application metrics. a Google Cloud Platform account: the free tier is more than enough. Most other cloud should also work the same. a host where Rancher will be running: This can be a personal PC/Mac or a VM in a public cloud. Google Cloud SDK: should be installed along kubectl on the host running Rancher. Make sure that gcloud has access to your Google Cloud account by authenticating with your credentials (gcloud init and gcloud auth login). To begin, start your Rancher instance. There is a very intuitive getting started guide for Rancher that you can follow for this purpose. Use Rancher to set up and configure a Kubernetes cluster by following the how-to guide. NoteNote: please make sure Kubernetes Dashboard is enabled and Kubernetes version is v.1.10. 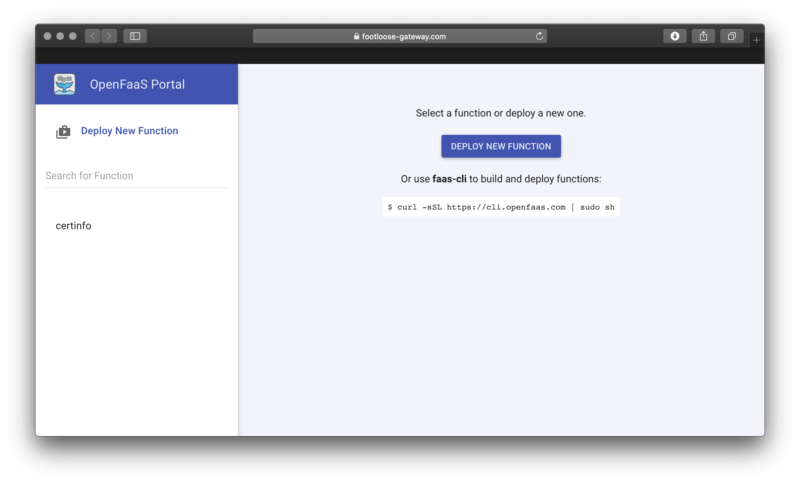 As mentioned previously, in this guide we will be covering the first two built-in tools: the Kubernetes dashboard and cAdvisor. A follow up article that discusses probes and horizontal pod autoscalers can be found here. The Kubernetes dashboard is a web-based Kubernetes user interface that we can use to troubleshoot applications and manage cluster resources. Let’s take a look on how to create a user with admin permission using the Service Account mechanism. We will use two YAML files. Select “Token” at the Kubernetes dashboard credentials prompt and enter the value you retrieved above in the token field to authenticate. Admin view: lists nodes, namespaces, and persistent volumes along with other details. We can get an aggregated view for our nodes (CPU and memory usage metrics) and an individual details view for each node showing its metrics, specification, status, allocated resources, events, and pods. Workload view: shows all applications running in a selected namespace. It summarizes important information about workloads, like the number of pods ready in a StatefulSet or Deployment or the current memory usage for a pod. Discover and Load Balancing view: shows Kubernetes resources that expose services to the external world and enable discovery within the cluster. Config and storage view: shows persistent volume claim resources used by applications. Config view is used to shows all of the Kubernetes resources used for live configuration of applications running in the cluster. Without any workloads running, the dashboard’s views will be mainly empty since there will be nothing deployed on top of Kubernetes. If you want to explore all of the views the dashboard has to offer, the best option is to deploy apps that use different workload types (stateful set, deployments, replica sets, etc.). You can check out this article on deploying a Redis cluster for an example that deploys a Redis cluster (a stateful set with volume claims and configMaps) and a testing app (a Kubernetes deployment) so the dashboard tabs will have some relevant info. cAdvisor is an open-source agent integrated into the kubelet binary that monitors resource usage and analyzes the performance of containers. It collects statistics about the CPU, memory, file, and network usage for all containers running on a given node (it does not operate at the pod level). In addition to core metrics, it also monitors events as well. Metrics can be accessed directly, using commands like kubectl top or used by the scheduler to perform orchestration (for example with autoscaling). Note that cAdvisor doesn’t store metrics for long-term use, so if you want that functionality, you’ll need to look for a dedicated monitoring tool. cAdvisor’s UI has been marked deprecated as of Kubernetes version 1.10 and the interface is scheduled to be completely removed in version 1.12. Rancher gives you the option to choose what version of Kubernetes to use for your clusters. When setting up the infrastructure for this demo, we configured the cluster to use version 1.10, so we should still have access to the cAdvisor UI. If you run Kubernetes version 1.12 or later, the UI has been removed, so kubelet does not listening on port 4194 anymore. You can confirm this with the commands above. However, the metrics are still there since cAdvisor is part of the kubelet binary. Monitoring is vital in order to understand what is happening with our applications. Kubernetes helps us with a number of built-in tools and provides some great insights for both, infrastructure layer (nodes) and logical one (pods). This article concentrated on the tools that focus on providing monitoring and metrics for users. Continue on to the second part of this series to learn about the included monitoring tools focused on workload scaling and life cycle management. The Local Persistent Volumes feature has been promoted to GA in Kubernetes 1.14. It was first introduced as alpha in Kubernetes 1.7, and then beta in Kubernetes 1.10. The GA milestone indicates that Kubernetes users may depend on the feature and its API for production use. GA features are protected by the Kubernetes deprecation policy. A local persistent volume represents a local disk directly-attached to a single Kubernetes Node. Kubernetes provides a powerful volume plugin system that enables Kubernetes workloads to use a wide variety of block and file storage to persist data. Most of these plugins enable remote storage – these remote storage systems persist data independent of the Kubernetes node where the data originated. Remote storage usually can not offer the consistent high performance guarantees of local directly-attached storage. With the Local Persistent Volume plugin, Kubernetes workloads can now consume high performance local storage using the same volume APIs that app developers have become accustomed to. To better understand the benefits of a Local Persistent Volume, it is useful to compare it to a HostPath volume. HostPath volumes mount a file or directory from the host node’s filesystem into a Pod. Similarly a Local Persistent Volume mounts a local disk or partition into a Pod. The biggest difference is that the Kubernetes scheduler understands which node a Local Persistent Volume belongs to. With HostPath volumes, a pod referencing a HostPath volume may be moved by the scheduler to a different node resulting in data loss. 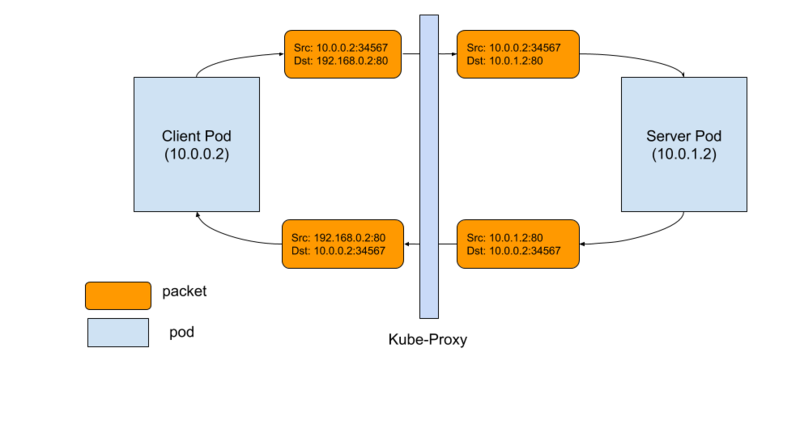 But with Local Persistent Volumes, the Kubernetes scheduler ensures that a pod using a Local Persistent Volume is always scheduled to the same node. While HostPath volumes may be referenced via a Persistent Volume Claim (PVC) or directly inline in a pod definition, Local Persistent Volumes can only be referenced via a PVC. This provides additional security benefits since Persistent Volume objects are managed by the administrator, preventing Pods from being able to access any path on the host. Additional benefits include support for formatting of block devices during mount, and volume ownership using fsGroup. Since 1.10, we have mainly focused on improving stability and scalability of the feature so that it is production ready. The only major feature addition is the ability to specify a raw block device and have Kubernetes automatically format and mount the filesystem. This reduces the previous burden of having to format and mount devices before giving it to Kubernetes. At GA, Local Persistent Volumes do not support dynamic volume provisioning. However there is an external controller available to help manage the local PersistentVolume lifecycle for individual disks on your nodes. This includes creating the PersistentVolume objects, cleaning up and reusing disks once they have been released by the application. Workloads can request a local persistent volume using the same PersistentVolumeClaim interface as remote storage backends. This makes it easy to swap out the storage backend across clusters, clouds, and on-prem environments. First, a StorageClass should be created that sets volumeBindingMode: WaitForFirstConsumer to enable volume topology-aware scheduling. This mode instructs Kubernetes to wait to bind a PVC until a Pod using it is scheduled. Then, the external static provisioner can be configured and run to create PVs for all the local disks on your nodes. Afterwards, workloads can start using the PVs by creating a PVC and Pod or a StatefulSet with volumeClaimTemplates. When the disk is no longer needed, the PVC can be deleted. The external static provisioner will clean up the disk and make the PV available for use again. You can find full documentation for the feature on the Kubernetes website. The primary benefit of Local Persistent Volumes over remote persistent storage is performance: local disks usually offer higher IOPS and throughput and lower latency compared to remote storage systems. Using local storage ties your application to a specific node, making your application harder to schedule. Applications which use local storage should specify a high priority so that lower priority pods, that don’t require local storage, can be preempted if necessary. If that node or local volume encounters a failure and becomes inaccessible, then that pod also becomes inaccessible. Manual intervention, external controllers, or operators may be needed to recover from these situations. For these reasons, local persistent storage should only be considered for workloads that handle data replication and backup at the application layer, thus making the applications resilient to node or data failures and unavailability despite the lack of such guarantees at the individual disk level. Examples of good workloads include software defined storage systems and replicated databases. Other types of applications should continue to use highly available, remotely accessible, durable storage. M3, Uber’s in-house metrics platform, piloted Local Persistent Volumes at scale in an effort to evaluate M3DB — an open-source, distributed timeseries database created by Uber. One of M3DB’s notable features is its ability to shard its metrics into partitions, replicate them by a factor of three, and then evenly disperse the replicas across separate failure domains. Prior to the pilot with local persistent volumes, M3DB ran exclusively in Uber-managed environments. Over time, internal use cases arose that required the ability to run M3DB in environments with fewer dependencies. So the team began to explore options. As an open-source project, we wanted to provide the community with a way to run M3DB as easily as possible, with an open-source stack, while meeting M3DB’s requirements for high throughput, low-latency storage, and the ability to scale itself out. 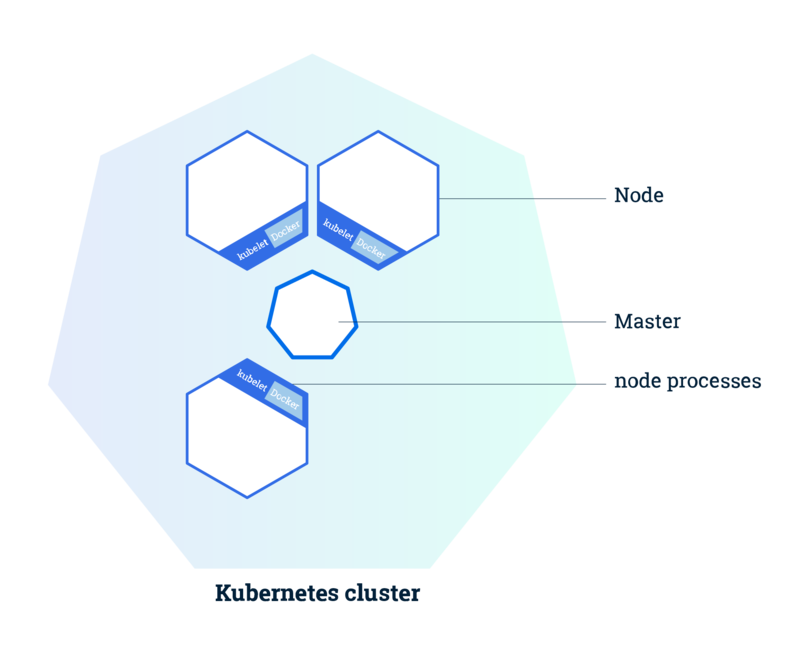 The Kubernetes Local Persistent Volume interface, with its high-performance, low-latency guarantees, quickly emerged as the perfect abstraction to build on top of. With Local Persistent Volumes, individual M3DB instances can comfortably handle up to 600k writes per-second. This leaves plenty of headroom for spikes on clusters that typically process a few million metrics per-second. Because M3DB also gracefully handles losing a single node or volume, the limited data durability guarantees of Local Persistent Volumes are not an issue. If a node fails, M3DB finds a suitable replacement and the new node begins streaming data from its two peers. Thanks to the Kubernetes scheduler’s intelligent handling of volume topology, M3DB is able to programmatically evenly disperse its replicas across multiple local persistent volumes in all available cloud zones, or, in the case of on-prem clusters, across all available server racks. As mentioned above, while Local Persistent Volumes provide many benefits, they also require careful planning and careful consideration of constraints before committing to them in production. When thinking about our local volume strategy for M3DB, there were a few things Uber had to consider. For one, we had to take into account the hardware profiles of the nodes in our Kubernetes cluster. For example, how many local disks would each node cluster have? How would they be partitioned? The local static provisioner README provides guidance to help answer these questions. It’s best to be able to dedicate a full disk to each local volume (for IO isolation) and a full partition per-volume (for capacity isolation). This was easier in our cloud environments where we could mix and match local disks. However, if using local volumes on-prem, hardware constraints may be a limiting factor depending on the number of disks available and their characteristics. When first testing local volumes, we wanted to have a thorough understanding of the effect disruptions (voluntary and involuntary) would have on pods using local storage, and so we began testing some failure scenarios. We found that when a local volume becomes unavailable while the node remains available (such as when performing maintenance on the disk), a pod using the local volume will be stuck in a ContainerCreating state until it can mount the volume. If a node becomes unavailable, for example if it is removed from the cluster or is drained, then pods using local volumes on that node are stuck in an Unknown or Pending state depending on whether or not the node was removed gracefully. Recovering pods from these interim states means having to delete the PVC binding the pod to its local volume and then delete the pod in order for it to be rescheduled (or wait until the node and disk are available again). We took this into account when building our operator for M3DB, which makes changes to the cluster topology when a pod is rescheduled such that the new one gracefully streams data from the remaining two peers. Eventually we plan to automate the deletion and rescheduling process entirely. Alerts on pod states can help call attention to stuck local volumes, and workload-specific controllers or operators can remediate them automatically. Because of these constraints, it’s best to exclude nodes with local volumes from automatic upgrades or repairs, and in fact some cloud providers explicitly mention this as a best practice. Local Volumes played a big role in Uber’s decision to build orchestration for M3DB using Kubernetes, in part because it is a storage abstraction that works the same across on-prem and cloud environments. Remote storage solutions have different characteristics across cloud providers, and some users may prefer not to use networked storage at all in their own data centers. On the other hand, local disks are relatively ubiquitous and provide more predictable performance characteristics. By orchestrating M3DB using local disks in the cloud, where it was easier to get up and running with Kubernetes, we gained confidence that we could still use our operator to run M3DB in our on-prem environment without any modifications. As we continue to work on how we’d run Kubernetes on-prem, having solved such an important pending question is a big relief. As we’ve seen with Uber’s M3DB, local persistent volumes have successfully been used in production environments. As adoption of local persistent volumes continues to increase, SIG Storage continues to seek feedback for ways to improve the feature. One of the most frequent asks has been for a controller that can help with recovery from failed nodes or disks, which is currently a manual process (or something that has to be built into an operator). SIG Storage is investigating creating a common controller that can be used by workloads with simple and similar recovery processes. Another popular ask has been to support dynamic provisioning using lvm. This can simplify disk management, and improve disk utilization. SIG Storage is evaluating the performance tradeoffs for the viability of this feature. The first release of Kubernetes in 2019 brings a highly anticipated feature – production-level support for Windows workloads. Up until now Windows node support in Kubernetes has been in beta, allowing many users to experiment and see the value of Kubernetes for Windows containers. While in beta, developers in the Kubernetes community and Windows Server team worked together to improve the container runtime, build a continuous testing process, and complete features needed for a good user experience. Kubernetes now officially supports adding Windows nodes as worker nodes and scheduling Windows containers, enabling a vast ecosystem of Windows applications to leverage the power of our platform. Enhancements shipped in Windows Server semi-annual channel releases enabled Kubernetes development to move forward – culminating with Windows Server 2019 on the Long-Term Servicing Channel. This is the best release of Windows Server for running containers. I recently came across a bug that causes intermittent connection resets. After some digging, I found it was caused by a subtle combination of several different network subsystems. It helped me understand Kubernetes networking better, and I think it’s worthwhile to share with a wider audience who are interested in the same topic. We received a user report claiming they were getting connection resets while using a Kubernetes service of type ClusterIP to serve large files to pods running in the same cluster. Initial debugging of the cluster did not yield anything interesting: network connectivity was fine and downloading the files did not hit any issues. However, when we ran the workload in parallel across many clients, we were able to reproduce the problem. Adding to the mystery was the fact that the problem could not be reproduced when the workload was run using VMs without Kubernetes. The problem, which could be easily reproduced by a simple app, clearly has something to do with Kubernetes networking, but what? 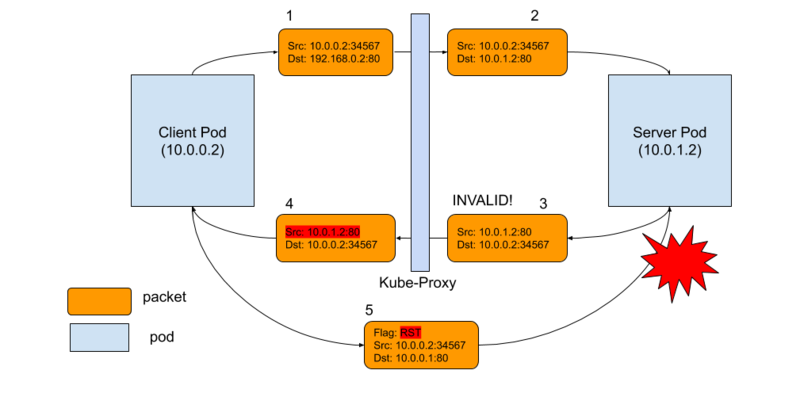 Before digging into this problem, let’s talk a little bit about some basics of Kubernetes networking, as Kubernetes handles network traffic from a pod very differently depending on different destinations. In Kubernetes, every pod has its own IP address. The benefit is that the applications running inside pods could use their canonical port, instead of remapping to a different random port. Pods have L3 connectivity between each other. They can ping each other, and send TCP or UDP packets to each other. CNI is the standard that solves this problem for containers running on different hosts. There are tons of different plugins that support CNI. For the traffic that goes from pod to external addresses, Kubernetes simply uses SNAT. What it does is replace the pod’s internal source IP:port with the host’s IP:port. When the return packet comes back to the host, it rewrites the pod’s IP:port as the destination and sends it back to the original pod. The whole process is transparent to the original pod, who doesn’t know the address translation at all. Pods are mortal. Most likely, people want reliable service. Otherwise, it’s pretty much useless. So Kubernetes has this concept called “service” which is simply a L4 load balancer in front of pods. There are several different types of services. The most basic type is called ClusterIP. For this type of service, it has a unique VIP address that is only routable inside the cluster. The component in Kubernetes that implements this feature is called kube-proxy. It sits on every node, and programs complicated iptables rules to do all kinds of filtering and NAT between pods and services. If you go to a Kubernetes node and type iptables-save, you’ll see the rules that are inserted by Kubernetes or other programs. The most important chains are KUBE-SERVICES, KUBE-SVC-* and KUBE-SEP-*. KUBE-SERVICES is the entry point for service packets. What it does is to match the destination IP:port and dispatch the packet to the corresponding KUBE-SVC-* chain. KUBE-SVC-* chain acts as a load balancer, and distributes the packet to KUBE-SEP-* chain equally. Every KUBE-SVC-* has the same number ofKUBE-SEP-* chains as the number of endpoints behind it. KUBE-SEP-* chain represents a Service EndPoint. It simply does DNAT, replacing service IP:port with pod’s endpoint IP:Port. NEW: conntrack knows nothing about this packet, which happens when the SYN packet is received. ESTABLISHED: conntrack knows the packet belongs to an established connection, which happens after handshake is complete. RELATED: The packet doesn’t belong to any connection, but it is affiliated to another connection, which is especially useful for protocols like FTP. INVALID: Something is wrong with the packet, and conntrack doesn’t know how to deal with it. This state plays a centric role in this Kubernetes issue. Enough of the background, so what really went wrong and caused the unexpected connection reset? As the diagram below shows, the problem is packet 3. When conntrack cannot recognize a returning packet, and mark it as INVALID. The most common reasons include: conntrack cannot keep track of a connection because it is out of capacity, the packet itself is out of a TCP window, etc. For those packets that have been marked as INVALID state by conntrack, we don’t have the iptables rule to drop it, so it will be forwarded to client pod, with source IP address not rewritten (as shown in packet 4)! Client pod doesn’t recognize this packet because it has a different source IP, which is pod IP, not service IP. As a result, client pod says, “Wait a second, I don’t recall this connection to this IP ever existed, why does this dude keep sending this packet to me?” Basically, what the client does is simply send a RST packet to the server pod IP, which is packet 5. Unfortunately, this is a totally legit pod-to-pod packet, which can be delivered to server pod. Server pod doesn’t know all the address translations that happened on the client side. From its view, packet 5 is a totally legit packet, like packet 2 and 3. All server pod knows is, “Well, client pod doesn’t want to talk to me, so let’s close the connection!” Boom! Of course, in order for all these to happen, the RST packet has to be legit too, with the right TCP sequence number, etc. But when it happens, both parties agree to close the connection. Once we understand the root cause, the fix is not hard. There are at least 2 ways to address it. Make conntrack more liberal on packets, and don’t mark the packets as INVALID. In Linux, you can do this by echo 1 > /proc/sys/net/ipv4/netfilter/ip_conntrack_tcp_be_liberal. Specifically add an iptables rule to drop the packets that are marked as INVALID, so it won’t reach to client pod and cause harm. The fix is drafted (https://github.com/kubernetes/kubernetes/pull/74840), but unfortunately it didn’t catch the v1.14 release window. However, for the users that are affected by this bug, there is a way to mitigate the problem by applying the following rule in your cluster. Obviously, the bug has existed almost forever. I am surprised that it hasn’t been noticed until recently. I believe the reasons could be: (1) this happens more in a congested server serving large payloads, which might not be a common use case; (2) the application layer handles the retry to be tolerant of this kind of reset. Anyways, regardless of how fast Kubernetes has been growing, it’s still a young project. There are no other secrets than listening closely to customers’ feedback, not taking anything for granted but digging deep, we can make it the best platform to run applications. There are already a lot of resources that explain what Istio looks like and how it works. I don’t want to repeat those here, so I am going to focus on one area – monitoring. The official documentation covers this but understanding it took me some time. So in this tutorial, I will guide you through it. So you can gain a deeper understanding of using Istio for monitoring tasks. A few days ago, the Kubernetes community announced Kubernetes 1.14, the most recent version of Kubernetes. Alongside it, Minikube, a part of the Kubernetes project, recently hit the 1.0 milestone, which supports Kubernetes 1.14 by default. Kubernetes is a real winner (and a de facto standard) in the world of distributed Cloud Native computing. While it can handle up to 5000 nodes in a single cluster, local deployment on a single machine (e.g. a laptop, a developer workstation, etc.) is an increasingly common scenario for using Kubernetes. This is post #1 in a series about the local deployment options on Linux, and it will cover Minikube, the most popular community-built solution for running Kubernetes on a local machine. Minikube is a cross-platform, community-driven Kubernetes distribution, which is targeted to be used primarily in local environments. It deploys a single-node cluster, which is an excellent option for having a simple Kubernetes cluster up and running on localhost. Minikube is designed to be used as a virtual machine (VM), and the default VM runtime is VirtualBox. At the same time, extensibility is one of the critical benefits of Minikube, so it’s possible to use it with drivers outside of VirtualBox. By default, Minikube uses Virtualbox as a runtime for running the virtual machine. Virtualbox is a cross-platform solution, which can be used on a variety of operating systems, including GNU/Linux, Windows, and macOS. At the same time, QEMU/KVM is a Linux-native virtualization solution, which may offer benefits compared to Virtualbox. For example, it’s much easier to use KVM on a GNU/Linux server, so you can run a single-node Minikube cluster not only on a Linux workstation or laptop with GUI, but also on a remote headless server. Unfortunately, Virtualbox and KVM can’t be used simultaneously, so if you are already running KVM workloads on a machine and want to run Minikube there as well, using the KVM minikube driver is the preferred way to go. This is not an official guide to Minikube. You may find detailed information on running and using Minikube on it’s official webpage, where different use cases, operating systems, environments, etc. are covered. Instead, the purpose of this guide is to provide clear and easy guidelines for running Minikube with KVM on Linux. Before we proceed, we have to verify if our host can run KVM-based virtual machines. This can be easily checked using the kvm-ok tool, available on Ubuntu. After installing libvirt, you may verify the host validity to run the virtual machines with virt-host-validate tool, which is a part of libvirt. In order to manage the Kubernetes cluster, we need to install kubectl, the Kubernetes CLI tool. The recommended way to install it on Linux is to download the pre-built binary and move it to a directory under the $PATH. Alternatively, kubectl can be installed with a big variety of different methods (eg. as a .deb or snap package – check out the kubectl documentation to find the best one for you). Before we proceed, we need to verify that Minikube is correctly installed. The simplest way to do this is to check Minikube’s status. At this point, a Kubernetes cluster with Minikube and KVM is adequately set up and configured on your local machine. In this tutorial we will install OpenShift in a container using a new tool called footloose by Weaveworks. Footloose is a tool built by Weaveworks which builds and runs a container with systemd installed. It can be created in a similar way to a VM but without the overheads. I wrote this tutorial because I wanted a light-weight environment for testing the OpenFaaS project on OpenShift Origin 3.10. An alternative distribution for testing is Minishift which also allows you to run OpenShift locally, but in a much more heavy-weight VM. You can use a Linux machine or MacOS host for this tutorial. ARM and Raspberry Pi are not supported. Note the additional ports 8443 and 53 used by OpenShift Origin and then 80 and 443 are bound for exposing your projects. If you already have services bound to 80/443 then you can comment out these lines. If you see an error / timeout at run_self_hosted.go:181] Waiting for the kube-apiserver to be readythen run the command again until it passes. You can now install the oc tool on your host machine or access the portal through https://127.0.0.1:8443 on the host. Let’s install OpenFaaS which makes Serverless Functions Simple through the user of Docker images and Kubernetes. OpenShift is effectively a distribution of Kubernetes, so with some testing and tweaking everything should work almost out of the box. OpenFaaS supports microservices, functions, scale to zero, source to URL and much more. Today we’ll try out one of the sample functions from the Function Store to check when an SSL certificate will expire. If you want to remove the OpenShift cluster you can run: footloose delete in the directory on the host. We’ve installed a functional OpenShift Origin cluster into a container and run it on a machine where the only requirement is to have Docker present. It should have taken us around 5 minutes. Once complete we deployed a production-grade application and were able to test workloads. 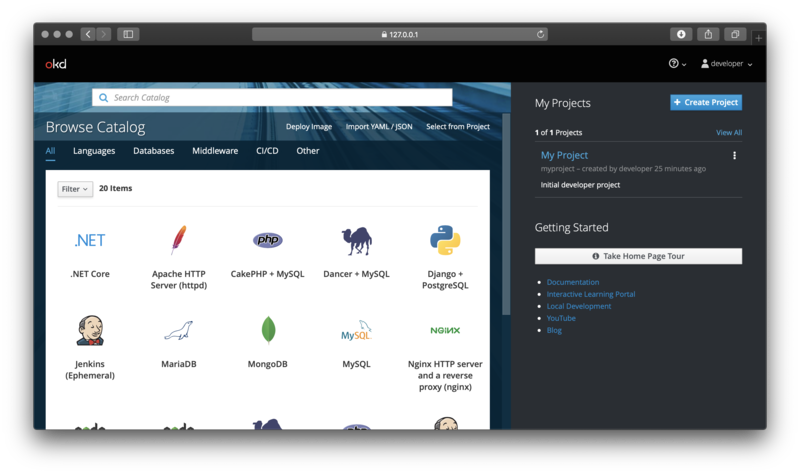 Whether you use minishift, Vagrant – tutorial by Liz Rice or footloose using this tutorial, testing your application on OpenShift hasn’t been easier than this. I want to give acknowledgements to Dale Bingham from Spalding Consulting and Michael Schendel from DESI for helping test and port OpenFaaS to OpenShift. This mainly involved a small patch to add an emptyDir volume for Prometheus. I’ll continue to work with Dale, Michael to create a dedicated documentation page for installing OpenShift on OpenFaaS. 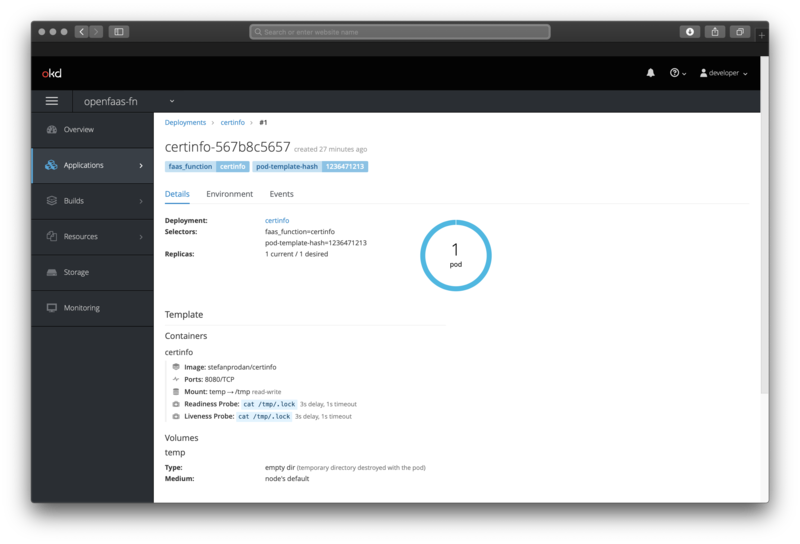 We’ll also be testing the helm chartand all other OpenFaaS features on OpenShift Origin such as scale-to-zero and if there is interest – OpenFaaS Cloud. Note: when using the helm chart authentication is enabled by default – just run faas-cli login. If you’re an OpenShift user, expert or just want to help out. Please join us on Slack. Today, the Cloud Native Computing Foundation (CNCF) announced Kubernetes 1.14, which includes support for Windows nodes. Kubernetes supporting Windows is a monumental step for the industry and it further confirms the work Docker has been doing with Microsoft to develop Windows containers over the past five years. It is evidence that containers are not just for Linux; Windows and .NET applications represent an important and sizeable footprint of applications that can benefit from both the Docker platform and Kubernetes. Docker’s collaboration with Microsoft started five years ago. Today, every version of Windows Server 2016 and later ships with the Docker Engine – Enterprise. In addition, to facilitate a great user experience with Windows containers, Microsoft publishes more than 129 Windows container images of its popular software on Docker Hub. Many Docker Enterprise customers are already running mixed Windows and Linux containers with Swarm, and an upcoming release of Docker Enterprise will allow our customers to expand their Windows options to Kubernetes as well. Today both Docker Enterprise and Docker Desktop users have found that the easiest way to use and manage Kubernetes is with Docker and now these users will have the same benefits with Windows containers as well. In the time since that first Windows Server release, we’ve been working closely with customers to understand how to make containerized Windows applications enterprise-ready for production. Our five years of experience shows us that runtime support for Windows-based containers is only one component of what enterprises require to make Windows containers with Kubernetes operational in their environment. An additional requirement is support for configuring containerized workloads with domain credentials and identity in an Active Directory environment. Initially we worked with Microsoft to plumb in gMSA credential support for individual containers running on Docker Engine in Windows. Next, we implemented orchestrator-wide support for gMSA credentials in Swarm. Using our experience so far, we are leading the design and implementation of gMSA support for Windows workloads in Kubernetes, delivering Alpha level support for gMSA support in Kubernetes 1.14. Many Windows-based applications are run on domain joined hosts and use Service Accounts managed by Active Directory to access other resources and services in the domain. Windows containers, however, are not full-fledged domain joined objects. Instead, Windows containers can run with a special type of service account introduced in Windows Server 2012 called group managed service accounts (gMSA). Windows uses credentials associated with a gMSA (in lieu of individual computer accounts) to enable containerized Windows applications to access other services in an Active Directory domain. Docker, in collaboration with Microsoft and the Kubernetes community, is working to add support for gMSA in Kubernetes. This encompasses: (1) custom resources to configure credential specs for gMSAs in a cluster wide fashion, (2) authorizing and resolving references to the gMSA credential specs from pod specifications and (3) passing down the full gMSA credential spec JSON to the container runtime (like Docker engine). This feature is in alpha with Kubernetes 1.14 and you can find more about its design and implementation here. We invite you to test this out and contribute to the effort which will help to further expand the types of applications that can be run in containers and will continue to work with the community on ensuring this reaches general availability. Windows admins and users also need overlay networking and dynamically provisioned storage to become enterprise-ready, and we are also working with the Kubernetes community in these areas and will have more to discuss and demonstrate at DockerCon 2019 in San Francisco. We look forward to sharing some of the progress here and hope to see you there!